Stanford nearly overcame both weather delays and an 11-shot deficit on the final day of the Pac-12 Conference Championships, but checked out of the event Sunday with a second-place finish. The Cardinal cut title-winning Oregon's lead to one stroke during the final round before cooling off and bowing out with a three-shot defeat. The three-day, 72-hole event at Boulder Country Club was trimmed to only 54 holes due to a series of weather delays, including several inches of snow throughout the tournament. After hovering around 50 degrees for Thursday and most of Friday, temperatures dropped late Friday afternoon and snow began to fall, suspending play before all teams finished their second rounds. The freezing temperatures left several inches of snow on the ground on Saturday, and no golf was played. But on Sunday the weather cooperated, hitting 60 degrees and melting the snow to allow for play to continue, as players completed Friday’s play before starting their final rounds. "I'm proud of the guys and their tenacity," said Conrad Ray, Stanford's Knowles Family Director of Men's Golf. "Oregon played well in challenging conditions over the last five or six holes. We had a chance, and that's all we can ask for after being quite a big behind to start the round. "We hope that we can carry this momentum and success into the NCAA Regional Championships." Stanford was 26-over through the second round -- which began Friday afternoon and ended Sunday morning after play was resumed after a day-long delay -- and was the only team to shoot under par in the final round. Stanford's closing 8-under 342 was the best score by any team in any round in the tournament. The Cardinal (363-363-342) was 18-over as a unit, three shots behind defending national champion Oregon. Washington and USC tied for third at 32-over. Oregon, which won its first outright league golf title since 1959, was led by medalist Wyndham Clark's 4-under 206. Stanford didn't make it easy on Clark, and stayed on his tail throughout after the final round began with a shotgun start. Franklin Huang made it a race to the end, coming out of the gate with birdies on three of the first four holes. Huang's only bogey on the day came at the par-4 14th. Huang (72-68-69) tied for second with USC's Rico Hoey at 1-under. Maverick McNealy, who started on the third hole, was 2-under through the 14th. He left nothing on the course, dunking an eagle on the par-4 first, then finishing with a birdie on the par-5 second hole for a 5-under 65. McNealy was 30th among individuals heading into the final round, and jumped all the way to fourth after rounds of 71-77-65. He was 3-over for the tournament. Brandon Wu (76-71-68 and Isaiah Salinda (75-73-67) tied for ninth at 5-over. Wu had an incredible spurt with five birdies over a mid-round, six-hole stretch. Salinda was 4-under after making the turn, giving one shot back before ending the day. Bradley Knox (70-76-74) tied for 31st and 10-over and Viraat Badhwar (75-74-75) tied for 47th at 14-over. Stanford Golf Course will be one of six sites to play host to the NCAA Regional Championships (May 15-17). Team selections for the six sites will be made Thursday. Final top 9 team and individual results are shown below - click on image to enlarge. Top seven team and player results after the first day of 36 holes are shown below as Stanford finished in third place 10 strokes behind Oregon and 7 behind Washington. Play was suspended for darkness with four groups having 1-3 holes remaining to play on day two. A recap by gostanford.com is provided below. Snow, wind and rain led to more bogeys than birdies Friday for the Stanford men’s golf team when it opened the Pac-12 Conference Championships at Boulder Country Club. The Cardinal played 36 holes with precipitation coming down from all directions in the morning hours, though conditions became relatively steady later in the day. Play was suspended due to darkness, with all but four groups finishing. Stanford, seeking its fourth straight Pac-12 title, shots consecutive rounds of 13-over 363. Defending national champion Oregon leads the 12-team field at 16-over, followed by Washington (+19) and Stanford (+26). Oregon’s Wyndham Clark and Washington’s Carl Yuan are pacing the medalist race at 2-under. Franklin Huang (72-69) leads all Cardinal at 1-over. He was 4-under in his second round through 13 holes until scattering three bogeys over the final stretch. Huang is tied for fourth. The Cardinal was nine shots off the pace through 18 holes. Bradley Knox was tied for fourth with an even-par 70 and Maverick McNealy shot a 1-over 71. Knox had one of four eagles registered by the field in the opening round, connecting in three shots on the 585-yard, par-5 second hole. McNealy, tied for 30th through 36 holes, responded with a 7-over 77 and Knox, tied for 16th, had a 6-over 76 in the second round. Brandon Wu helped right the ship with rounds of 76-71, good for 25th. Isaiah Salinda (75-73) is tied for 30th with McNealy, and Viraat Badhwar (+9) is tied for 36th after rounds of 75-74. * Stanford, the three-time defending Pac-12 champion, aims for an unprecedented fourth title when it heads to the Pac-12 Championships this week in Boulder, Colorado. * The Cardinal could become the first program to win four consecutive Pac-12 crowns since Arizona State copped six from 1995-2000. * Colorado will serve as host of the 58th annual Pac-12 Championships. It's the first time in 45 years the Buffaloes have entertained a conference championship, dating to 1972 when Colorado was a member of the Big Eight Conference. * The Pac-12 is led by three top-10 teams in No. 1 USC, No. 8 Stanford, No. 10 Oregon, No. 22 Arizona State and No. 25 Colorado. * According to Golfstat's statistical rankings for average score, six of the NCAA's top 10 individuals hail from the Pac-12 -- No. 1 Wyndham Clark of Oregon (69.54), No. 4 Collin Morikawa of California (69.78), No. 6 Maverick McNealy of Stanford, No. 7 Jared du Toit of Arizona State (69.88), No. 9 Norman Xiong of Oregon (70.14) and No. 10 Sean Crocker of USC (70.15). * McNealy, the Pac-12 medalist in 2015 and current top-ranked amateur in the world, will look to become the first Pac-12 golfer to earn medalist honors multiple times since Arizona State's Paul Casey won three straight titles from 1998-2000. * Stanford enters the event having posted a top-four finish in six events on the season. McNealy leads individuals with five top-10 finishes, including his record-tying 11th tournament victory at the Nike Collegiate. He matches Tiger Woods and Patrick Rodgers on the school's all-time wins list. * McNealy has shot 69 or better in 14 of 23 rounds on the season. Junior Franklin Huang (71.57) and sophomore Brandon Wu (72.00) have combined for nine top-10 finishes. * Seventy-two holes of stroke play over three days of competition shall decide the Pac-12 championships. The 36-hole day of competition will fall on the first day of the tournament. The championship will be played in threesomes to ensure competition is completed on time. Boulder Country Club will have a 7,129-yard, par-70 configuration for the tournament, with the elevation at the club of 5,220 feet -- the highest for a men's championship in conference history. * In the event of a tie for the team championship, NCAA team tie-breaking procedures shall be followed to determine the champion. * In the event of a tie for the individual championship, a sudden-death playoff shall be held immediately after the conclusion of the final round to determine the champion. If the tie is between members of the same team, the playoff shall be held at the discretion of that team's coach, who shall be allowed to determine whether a playoff shall be held. If a playoff is not held, the individuals shall be declared co-champions. * Stanford captured the inaugural Pac-12 title in 1960 and has since won the conference championships in 1968, 1970, 1974, 1977, 1992, 1994, 2014, 2015 and 2016. * Stanford holds claim to 22 individual league medalists, tied with USC for the conference lead. The Pac-12 champions to wear the cardinal and white include Pete Choate (1960, 1962), Sandy Adelman (1969), Mike Peck (1977, 1978), Jack Skilling (1980), Don Walsworth (1986), Christian Cevaer (1989, 1992), Tiger Woods (1996), Jim Seki (2002), Andrew Yun (2012), Patrick Rodgers (2014) and Maverick McNealy (2015). * In 1996, Tiger Woods' 61 at the par-72 Big Canyon Country Club in Newport Beach, California, was the second-lowest single round score in the history of the Pac-12 Championships. Only Paul Casey's collegiate-record 60 in the 1999 league tournament was lower. Woods fired a Pac-12 Championships record 11-under in his round. SANTA CRUZ, Calif. – Bradley Knox, Maverick McNealy and Isaiah Salinda finished among the top five individuals and Stanford placed second in the Western Intercollegiate, which wrapped up Sunday at Pasatiempo Golf Club. 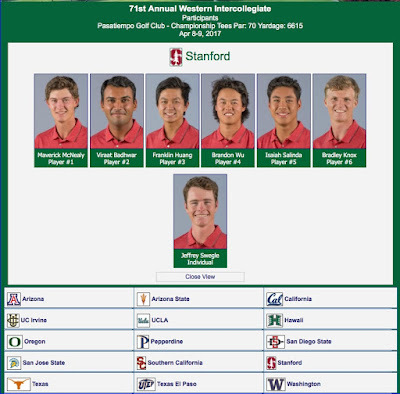 Stanford (351-347-370) was 18-over in one of the longest-running men’s golf championships in the United States, with Pac-12 Conference foe USC winning the event at even-par. The 54-hole event spanned two days, with team scores calculated by a play-six, score-five format. The tournament featured an incredible five holes-in-one, including one buried in consecutive rounds by Cal’s William Aldred. McNealy, who won the tournament in 2016, made a run at medalist honors this year but took a step back by going 3-over during his final three holes. McNealy (68-68-74) was fourth at even-par and USC’s Justin Suh bested the field at 5-under to take home the title. Salinda (69-66-76) and Knox (71-70-70) tied for fifth at 1-over, with Knox moving up six spots from his standing through 36 holes. Salinda punctuated his outing with an eagle on the par-4, 378-yard fourth hole. 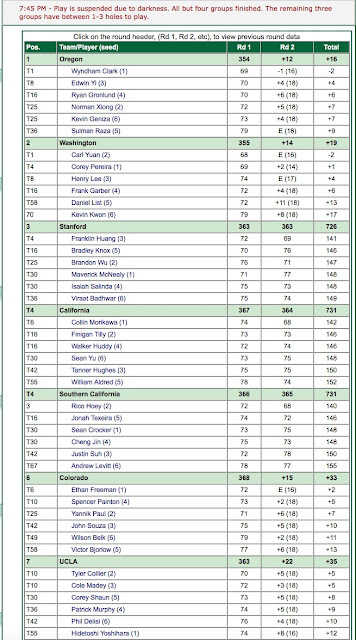 Franklin Huang (71-71-74) held it down in 24th at 6-over, and Brandon Wu (72-72-76) was 44th. Jeffrey Swegle (74-75-72), competing as an individual, was 11-over and took 47th. Viraat Badhwar (77-74-76) was 17-over. Stanford turns it attention to the Pac-12 Championships (April 28-30) in Boulder, Colorado. The three-time defending champion is seeking an unprecedented fourth straight league crown. A final scoreboard showing the top 9 teams and individual scores are shown below - click on image to enlarge. Western Intercollegiate - Pasatiempo Golf Club (Par-70 * 6,615 yards) - Santa Cruz, Calif.
* Stanford looks to defend its team title at the Western Intercollegiate (April 8-9) in Santa Cruz, California. Held at the renowned Pasatiempo Golf Club, the Western Intercollegiate is one of the longest-running men's golf championships in the United States. The tournament is hosted by San Jose State. * Maverick McNealy set a Western Intercollegiate record in 2016 with a 16-under 194, breaking the 54-hole tournament's best mark by five strokes. Runner-up Aaron Wise's 14-under 196 would have been a tournament record, yet Wise lost by two strokes to McNealy. Trailing Oregon's Wise by one shot entering the final round, McNealy played hole Nos. 6-10 in 5-under to pull ahead. He wrapped up with a 6-under 64 for his 10th collegiate victory. The individual title helped Stanford post its first team victory on the season. The Cardinal shot 9-under 1,041 in the play-six-count-five format. * Along with defending individual champion McNealy, the former champions list includes such notable players as Johnny Miller, Peter Jacobsen, Mark O'Meara, Duffy Waldorf, Bobby Clampett and Patrick Rodgers. * Pasatiempo Golf Club is regarded for its breathtaking scenery and deep-rooted golf history. Bobby Jones was one of the first players to hit from the first tee when the course opened in 1929. The course was designed by the famous English architect Alister MacKenzie, who claimed Pasatiempo was his best layout, ahead of even Cypress Point and Augusta National. * The 15-team field includes No. 8 Stanford, Arizona, No. 20 Arizona State, Cal, Hawaii, No. 10 Oregon, Pepperdine, San Diego State, San Jose State, No. 15 Texas, UC Irvine, UCLA, No. 2 USC, UTEP and Washington. * The 54-hole tournament spans two days (36 holes on Saturday, 18 holes on Sunday). Team scores will be calculated by a play-six, score-five format.